After Tinga Tinga, Lilanga and Makonde one wonders if Tanzania has some more art styles to offer to the world. And the answer might be “yes”. Have you ever seen the paintings of Masaai tribe done by knife? Usually the background of the paintings is white, the color is heavy and thick and the paintings are abstract. The slim and tall Masaai people dressed in red or blue clothe are lined up like sticks next to each other – these are the simplest paintings. But the more advanced may involve domestic or wild animals, trees or huts. And there are not only Masai people but also themes such as Zanzibar narrow streets or even doors. 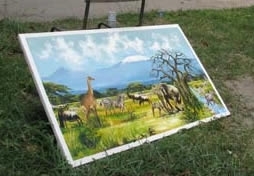 Certainly you have seen many similar paintings on your Kenya holiday in Mombasa or Nairobi. The paintings are everywhere and the next question is where they come from and who is originator. The answer is somewhat exciting. The origin traces to an old man from Kigoma in west Tanzania who used to decorate caves for some reasons. He also painted on hut walls. His name is Atanas Mwanasola Kiswanta and he died in 1992. He must have been born in the beginning of 20 century. His wife Matrida is still living in Kigoma. He was the babu, the guru, the teacher who did not yet breathe life into those many paintings seen in Kenya and Tanzania, but his family members did. And they quickly lost control over their own art since the paintings are copied and mass produced without any benefit to the creators. But at least as it seems – people start to call these paintings Atanas paintings and some are talking about Atanas style such as Tinga Tinga style or Makonde style. The Atanas family is definitely an artistic family of talented creative people. There are from Fipa tribe and they are all close relatives. As the Tinga Tinga family they struggle to preserve their art and artistic ideas without much success. 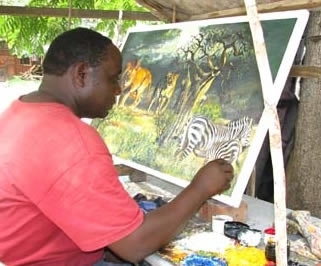 But in contrary of the Tinga Tinga family they use the modern colours and techniques, such as the acrylic colour and knife techniques. They have never got any support from any NGO like Tinga Tinga family but survived only due to their customers and sponsors. 2. 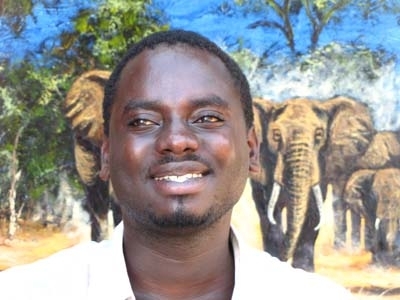 Msole Helman Kiswanta – now painting and his child is the painter Nelson Helman – he signs Helman or Spaso. Helman has brother (seems child of Msole too) who is called Steve Helman Kiswanta. 3. Ndali Sweatbed Kiswanta - successful painter who decided to retire. After exploring the family tree we may write a list of all painters found. It is probable that I may find more family members. It is undeniable that tens of artists are active in Tanzania, thus creating the notion of Atanas style. Until today we know about 9 art members of Atanas family. Is the family aware of the copyrights to their own art works? Is that ok that tens or maybe hundred of young people in Kenya imitates their designs? And what about their name? It is as much a family brand as well as term for their art style. Tinga Tinga name was registered all over the world, last time by Tiger Aspect who was commissioned by BBC and Walt Disney. Shall we leave the Atanas family without any support and advice how to protect their own brand and art?